(Dollard-des-Ormeaux, Quebec) Saturday, April 16 - The third day of the Dodge Cup was in full swing at the Dollard-des-Ormeaux Civic Center with teams battling it out to the end to secure a spot in the semi-finals and get one step closer to becoming provincial champions. Like the rest of the tournament, many games have been close. A handful of games have even led to overtime and at times shootouts, proving how hard each team wants to win. The Bantam AA Quebec-Chaudière-Appalaches Huskies were among one of those teams. The Huskies beat the Mauricie Rafales in overtime to earn themselves a spot in Sunday’s semi-finals. To celebrate their victory, the girls traded in their hockey skates for dancing shoes and got down with the Break City Street Dance Program. The dance group was present at today's tournament to provide some entertainment and teach players and fans alike how to "bust a move". City dancers. In fact the Husky girls even had some parents joining in on the fun; dancing to the Macarena and the Cha Cha Slide. 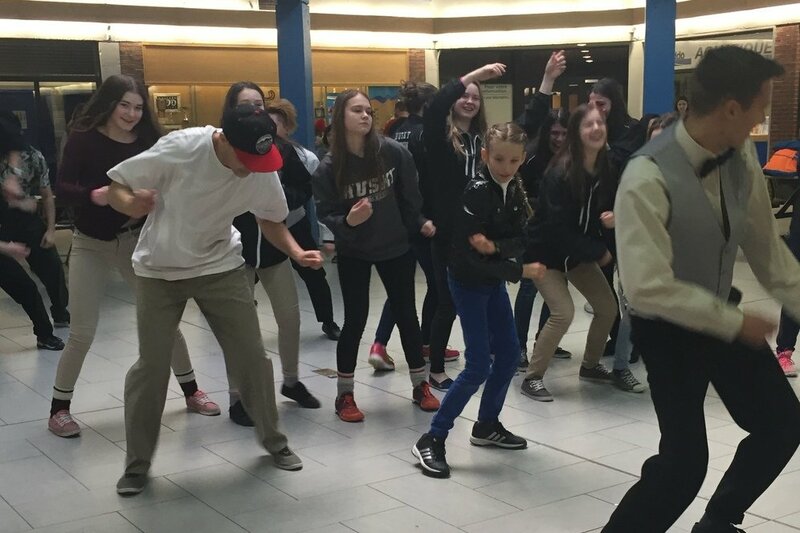 It seemed everyone was having a good time with Break City dance group and was able to let loose and fun between hockey games.